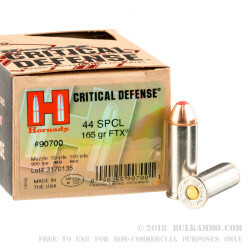 This 44 S&W Special cartridge from Hornady’s Critical Defense line of ammunition sports a 165 grain Flex Tip jacketed hollow point projectile. 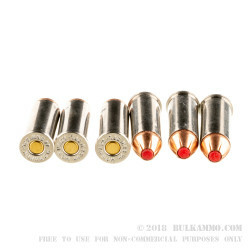 This bullet’s soft polymer tip serves to keep its hollow point from becoming jammed with fabric upon impact, when it is quickly wedged within the bullet’s cavity to initiate reliable and consistent expansion. The bullet’s InterLock ring ensures that its one-piece high antimony lead core remains locked to its heavy jacket for optimal weight retention during penetration. This bullet further offers a ballistically efficient secant ogive profile which delivers a flat trajectory for stellar accuracy. 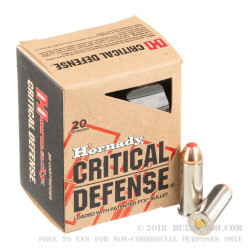 Along with its 900 fps muzzle velocity, this round’s technologically advanced bullet can be relied upon to deliver great terminal performance in self-defense situations. This round also offers a nickel plated brass casing, which is easily visible in low-light environments. Its low flash propellant means you will not be blinded by your first shot in the dark, so you can count on accurate follow-up shots afterward. You’ll be ready for most anything when you chamber this round in your everyday carry. A: Hello! 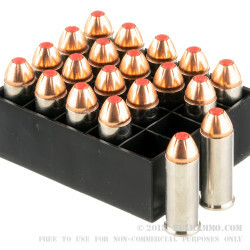 This ammunition is loaded in nickel plated brass cases with boxer primers and is reloadable.